Nike is taking the basketball shoe back to the future. On February 17 Nike released the much anticipated Adapt BB sneaker. The shoe is the first-ever widely produced basketball shoe that incorporates the self-lacing technology originally imagined in the “Back to the Future” movie franchise. Instead of Marty McFly. Nike says the “Adapt” platform will allow the company to push updates and added capabilities to the shoe well after it has already been purchased. 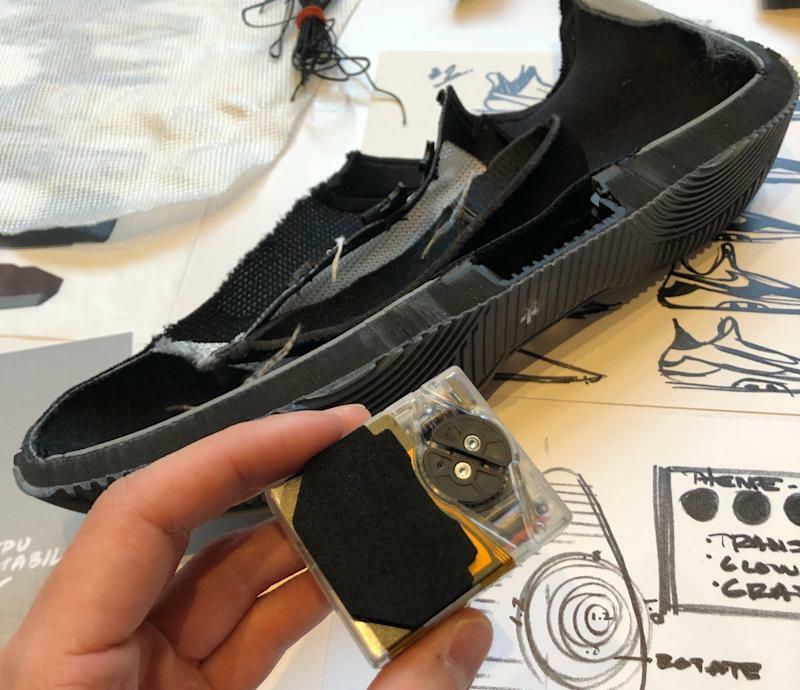 The company also included a 3D accelerometer and a gyroscope inside the shoe, hinting that at some point the app will allow users to measure data on their game performances. Nike hopes to scale this technology into other shoe silhouettes and, possibly, other wearables. “As you think about the future of the powered athlete, you can imagine two intelligent products on your body that will, in the future, give us more understanding of the body and motion,” Nike global head of digital products Michael Martin told Yahoo Finance. But are the shoes subject to a mid-dunk hack? Martin said nobody can “intercept” the encrypted connection between the shoe and a smartphone, adding that if users are uncomfortable with linking the shoe to a phone, they are still free to use the self-lacing technology without a phone connection. Nike says the Adapt BB has a battery life of two weeks — but if your feet are in the shoes when they die, you can still manually loosen the laces. When the shoes need more power, users drop them on a wireless charging mat. The new shoes retails for $350, a hefty premium above existing high-end basketball shoes like the $185 Nike LeBron 16 or the $160 Adidas Harden Vol. 3. The Adapt BB is not Nike’s first self-lacing silhouette; in 2016 the company released 89 “Nike Mag” units that were replicas of the kicks that Marty McFly himself wore in the 1989 film. The same year, the company released the “HyperAdapt” low-top shoe which retailed at an eye-popping $720. But the Adapt BB will be the first commercially available self-lacing shoe at a slightly more accessible price point. The Nike Adapt BB is a great concept but sometimes concepts don't translate to real life. This is not the case for the Adapt BB. The FitAdapt tech really does what it was designed to do — lock you down. "This is a new technology that we have packaged on your foot — the focus from an engineering standpoint was durability and reliability,” said Nike Senior Mechanical Engineer Narissa Chang. The Adapt BB is also waterproof and impact-resistant which helps when playing an aggressive sport like basketball. And when it came to testing, Nike put the Adapt BB through its paces — literally. The Adapt BB was put through 300 miles of running during testing and the self-lacing system can pull up to 32 pounds of force according to Nike. The shoe can also withstand 30,000 impact pulses at 780 pounds of pressure, reflecting the intensive rounds of testing that went into the shoe’s design. Nike claims the Adapt BB is durable enough to use on-court, and Jayson Tatum of the Boston Celtic unveiled the shoe during a game back in January. Once you take a few steps in the Adapt BB you can see that all of the aggressive testing paid off. You feel like you are ready for battle when you put on the Adapt BB — your foot is locked in and it’s not going anywhere, which means it is a durable and robust shoe to play basketball in. The Nike Adapt BB looks and feels like a trip to the future. Reggie Wade is a writer for Yahoo Finance. Follow him on Twitter at @ReggieWade.